While talking with a friend of mine over Skype and doing some screen sharing, I took down notes as I watched her struggle with the recipe entering process as a first time user. Though finding an ingredient is super easy (I wrote a very slick auto-complete drop-down for this), the issue became clear that KitchenPC needs an easier way to express ingredient amounts. Dealing with dropdowns, multiple text boxes, etc is just a deal-breaker. After giving it some though, I decided I was dealing with this UI paradigm completely backwards. Once an ingredient is selected, the first step is to choose a form. For example, when working with cheddar cheese, the form dropdown contains “By Weight”, “By Slice”, “shredded” and “diced”. Once the user selects a form, the unit dropdown is populated with units acceptable to that form. If the user chooses “By Weight”, weight units such as ounces and pounds appear. 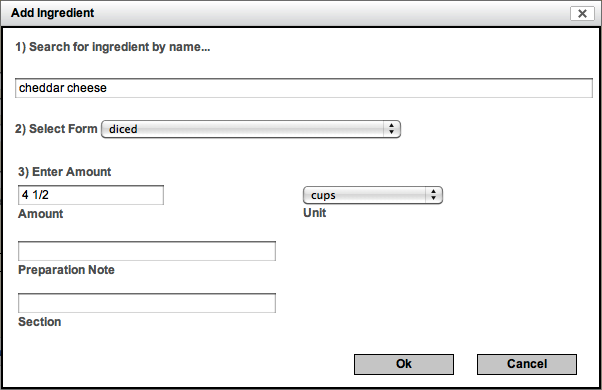 If the user selects a volumetric form such as “shredded” or “diced”, units such as cup and tablespoon appear. Since “Slice” is a unit itself, the user can only enter a numeric value when this form is selected and the unit drop-down is disabled. Grab mouse, click the forms dropdown, select a form. Click on Amount text box. Move hands back to keyboard. Grab mouse, click on the unit dropdown, select a unit. A more advanced user is aware of the tab button to navigate web pages. However, most are not aware of the keyboard shortcuts when dealing with a dropdown list. Firefox is, of course, superior to IE in this respect as the up and down keys will intuitively open the list. However, most users will still be tabbing, mousing, and typing all over the place. If the unit type they want is not available for the form they “guessed”, the user gets frustrated and yells at the screen. If they haven’t given up by that point, they might mess around with the forms (a concept that really doesn’t make any sense to the average user in the first place) trying to find one that allows their desired unit. A user interface that mimics how humans actually think would start with the amount. Regardless of the unit or form, I always need an amount right? So why not start with this. The second thought would be the unit type. Once an amount and unit type have been determined, the user interface should be smart enough to ask for a form if and only if the provided information is ambiguous with multiple form types (rare in most ingredients). For example, “4 slices” and “2 pounds” is a perfectly acceptable usage for cheese. When expressed in this way, the form can be ascertained automatically. If the user says “slices”, they mean the “By Slice” form. If they say “pounds” they mean the “By Weight” form. However, if the user enters “4 cups”, this expression presents ambiguity between the “shredded” and “diced” form types. Only in this case should the user even be bothered to worry about the form of the ingredient, and they should only be bothered with this if and when the information is needed. Don’t bother the user, just let them type. Don’t change anything automatically or confine them to only being able to type certain things. It should be possible to enter an ingredient usage in a single textbox. Users should not have to tab around. Help should be provided passively, to “steer” the user along as they type. User types in “1 1/2” and presses space to type in a unit. A wheel of units available (across all forms) appears. The user can optionally press ENTER and the rest of the word is filled out for them. At this point, “1 1/2 Tablespoons” is entered, however this measurement is ambiguous. Thus, a new wheel pops up with forms that allow volumetric measurements. The user sees the wheel with “diced” and “shredded” and is allowed to type one or select one with the up/down keys. When a form is selected, the usage can now be parsed in KitchenPC “meta” language and stored in the database, thus a nice green checkmark is displayed to indicate KitchenPC likes their entry. I like this UI because it’s a single textbox and allows the user to express any ingredient usage across any form without taking their hands off the keyboard. In fact, many times the amount can just be pasted into the textbox, especially since I can parse aliases of unit types (such as “1 oz”, “2 c”, “3 lbs”, etc) and map them to the correct unit type internally. It also fits in with my existing custom form ability. If what the user types cannot be parsed, the amount will be used as a custom form and be queued for manual processing. They say a picture is worth 1,000 words, but I’ve decided to go a step further and attach a video of tonight’s prototype. I’m hoping this technology can be integrated into the main KitchenPC UI fairly easily and make it into the initial public beta. I think it’s a huge step forward in usability, and perhaps will lessen the number of my users who yell curse words at the screen. At the very least, it’s a start. Nice work… this is pretty slick!